NATIONAL HARBOR, Md. — U.S. Defense Secretary James Mattis said he’s open to funding new space programs if Congress delivers on the military spending hike the White House has sought. 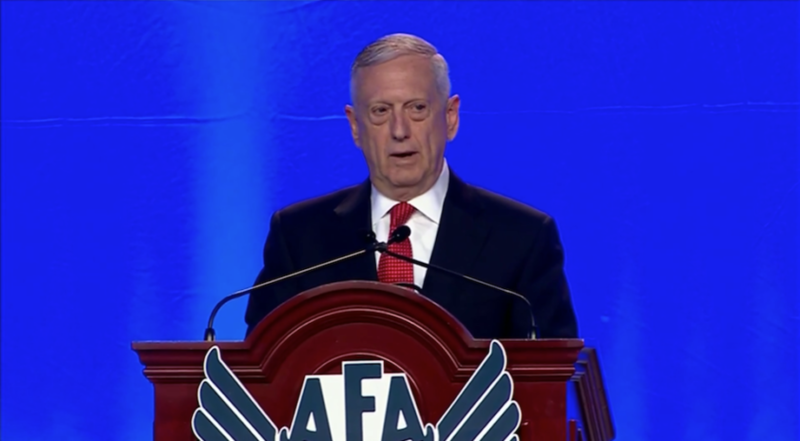 “In space, we need new starts in order to take advantage of what industry can deliver if we are willing to invest there,” Mattis said Sept. 20 during a keynote speech at the annual Air Force Association Air Space Cyber conference here. Space is becoming a more dangerous military region, Mattis noted. He pointed out it has taken only a decade for space, as well as cyber, to emerge as major warfighting domains. The U.S. military, he said, must move at a faster pace to keep up. “If we fail to adapt at the speed of relevance, our forces will lose,” he said. While securing enough money for that effort is important, he said, the problem in developing new space or other programs is more than a matter of funding. He implored Air Force officers and officials not to be hampered by “imaginary legal restrictions” in dealing with industry on developing more lethal ways of waging war. When he first took over as defense secretary, he said, he set up a meeting with industry officials, only to be told he could not do that because he would be violating ethical rules. While federal procurement rules are set up to ensure all bidders have equal access to formal contract requirements, Mattis said it is fine for military officers and officials to discuss capability needs, potential technologies and other issues.